'All About Presentations' by Jazz Factory: What your boss hates in your presentation? What your boss hates in your presentation? As a presenter you want to do well. You want to be understood by your boss. You want to impress him/her with your presentation skills (and your work). But how can you do well? You don't even know what your boss likes and does not like? Do you know what your boss hates in your presentation? And why should I restrict it to your boss? Even your colleagues and clients hate the same things about your presentations. But what are those things that they hate in your presentation? "As an audience, what do you hate most in a presentation?" Most of these people work in corporate India as managers and make (or see) presentations day in and day out. I asked HR managers, teachers, investment bankers, IT professionals, entrepreneurs and even a doctor who delivers a lot of presentations across India (and abroad). The answers were diverse but on a closer scrutiny one can find common traits. Most of the answers were kind of commonsensical (Ya, I know that). But the very reason they are in the list shows that you are making these mistakes very often. 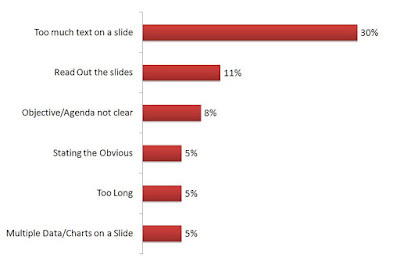 The biggest mistake which audiences find in your presentation is: "Too much text on the slide." You would have heard this so many times. Every presentation guru would have said this a thousand times to you. Every other 'How to make a great presentation' tips would talk about it. Yet what is the result. You are still making the same error. Please Note: If so many people are being put off due to excess text on the slide, it means that almost every presenter is committing this mistake. And committing it very frequently. Open your last presentation and see if you made this mistake. The next biggest mistake you make is: "Reading out from the slides." Like the first one, even this one is a Fundamental Mistake of Presenting. It is like a Class X student committing a simple addition error in a maths problem. How can you do this dear? The third biggest mistake you commit is: "Unclear objective and lack of direction." It is very interesting to note that this has come up in the top three. The answer respondents give to a survey reflects what is on the top of their mind. It is called TOM (Top Of Mind Recall). And what is at the top of their minds? Things which happen very often. That is why they are recalled faster. So, unclear objective and lack of direction is a mistake which you are committing too often and hence is staying in the mind of your boss. A presentation is composed of three elements; Content, Design and Delivery. Content is the planing part before you start making slides whereas Delivery means presenting your slides to the audience. If we look at all the responses of the survey, 51% related to Design, 30% to Delivery and 19% to Content. The thing that upsets people most is not 'what you have to say' but 'how you say it'. Your mistakes in slide design and delivery are overshadowing your content. For all you know, your content might have been great, but yet your boss did not like it. Why? Because, that great content (coming out of your hard work and effort) got diluted by your 'excess words on the slide' and your 'reading our from the slides'. Take cognizance of these mistakes. Accept the fact that you might be making these mistakes (and you are not even aware of it). Make sure that the next time you present to your boss, you do justice to your hard work and do not repeat them again. What is the suggested amount of text or number of points that can be included in a slide so that our audience will not dislike it? There is no such rule but the lesser the better. Many a times, you can use just 2 or 3 words. At other times, you might have to have 20 or 30 words. Just ensure the slides are not full of text. If the slide has 30 words, it can be split into two slides of 15 words. There is one way you can stop reading from the slides: Start writing only 2/3 words on a slide. I mean, shorten your sentence from 20 words to three words. Now, when you see your slides, these 2/3 words will remind you and you will 'speak' 20 words. Example: Take a slide which has 2 bullet points. Each bullet point will be a complete sentence. Say 20 words. Now reduce these 20 words into 3-4 words. When you see this bullet, you will speak the 20 words.